What are the Challenges to Marketing Precision Medicine Today? Genomics makes it possible to study an individual’s DNA to figure out their predisposition toward specific genetic disorders. Drug makers may then develop personalized medical solutions for a patient or group of patients based on DNA diagnostics. You may have realized how tricky it’s been in the field of genomics and precision medicine to market their products to hospitals and primary caregivers. Likewise, patients with genetic disorders are not always quick to accept such non-traditional medications. That’s a challenge that health care providers are still grappling with to date. But what’s slowing the implementation of genomic medicine within primary care? There are many possible reasons, and one of them is the individualized nature of the medications. With traditional drugs, a one-size-fits-all marketing approach may suffice. However, personalized genomic solutions require precision marketing. These are not mass-market drugs. They’re products tailored to an individual’s DNA. Lack of clinical evidence: Physicians don’t readily accept medical solutions whose efficacy they don’t know. Perhaps, pharma companies are not providing sufficient evidence, including clinical trials results, quick enough to demonstrate the effectiveness of their genomic medical solutions. Lack of patient education: Patients want to know how genomics prescription medicine can help treat or manage their genetic complications. It seems that caregivers are not always supplying their patients with the information they need to make appropriate choices. Caregivers don’t understand their patients’ needs: It appears that many healthcare providers have not fully synchronized their electronic medical record (EMR) software with their genomic test result systems and clinical decision support. As such, clinicians may not always have the right diagnostic information at hand. The great news is that, with a proper marketing strategy, you can close the knowledge gap. 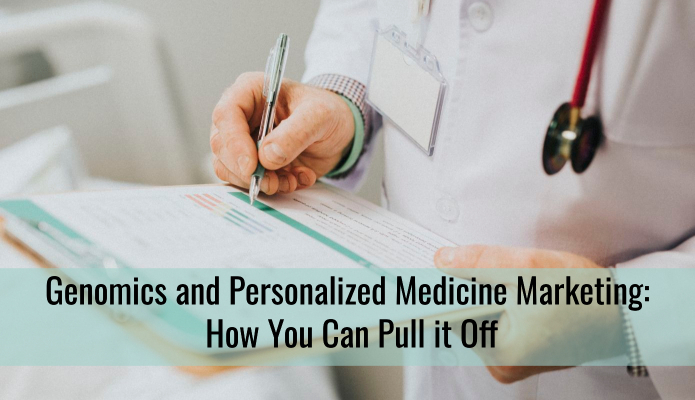 It’s necessary to help your audience understand the benefits of the personalized medication you’re offering. The U.S. Food and Drug Administration can allow the direct-to-consumer advertising or promotion of your genetic health risk tests via TV, print media, or the internet on certain conditions. In 2017, the FDA allowed 23andMe to market its Personal Genome Service Genetic Health Risk (GHR) exams directly to consumers. So, if you operate a genetic testing lab, you may opt to reach out to potential consumers without necessarily involving their primary caregivers. However, the FDA requires that you provide your direct marketing information in a manner that consumers can comprehend and utilize. Does your GHR tests information help consumers make the right decisions? If you provided genetic test results for Parkinson’s disease, for example, would your information guide at-risk individuals to seek an early diagnosis? Health providers need some convincing before they can start offering any new precision drug within primary care. If you’re marketing such medication to these establishments, you have to emphasize the potential benefits. Usually, these include better treatment outcomes as well as lower treatment costs. Your promotional messaging should communicate the value of your genomics medicine to healthcare organizations and their patients. Be sure to customize information to physicians, hospitals, or clinicians based on highly precise patient use studies. But how do you figure out what your target audience or patients want? You can start by piecing together information from online and in-person consumer interactions. It’s easier to commercialize personalized medicine for patients when you can map every customer interaction in detail. Do you know what information your customers are looking up online? Who are your audiences’ most followed influencers on social media? If you’re representing a company that provides genomics healthcare solutions, full visibility into all potential data points helps you grasp customer expectations and needs. This way, you can extract critical consumer insights to inform your content marketing strategy. Healthcare providers are increasingly using video to inform while promoting medical products. A good example is this video by Mayo Clinic. The one-minute clip includes brief interview excerpts with a professional. It highlights the features and benefits of a skin care remedy. High-quality videos can work for you too if used as a mission-critical component of your marketing campaign. They can help win the attention of consumers looking up health-related insights online. Just how effective is video marketing? For starters, it can boost your website’s search engine (or SERP) ranking. Likewise, the content can increase email click-through rates by up to 300%. Video content is a great way to explain the features and benefits of your personalized medicine to skeptic healthcare providers. In that case, consider highlighting key statistics pointing to the efficacy of the solutions you propose. For example, can you share relevant clinical trials results? According to your research, how much on average can a typical health provider (and their patients) save in treatment costs? Remember to address customer pain points and concerns, such as potential side effects. YouTube: When it comes to the popularity of search engines, YouTube comes second to Google. So, create a channel and upload informative videos about your medical products. Facebook: This is still the most popular online social networking platform. Facebook videos are a great way to inform or educate healthcare stakeholders. You may deploy such content to catalyze conversations about your personalized medical products and evaluate consumer feedback based on comments, likes, and shares. Consider uploading your videos directly on Facebook, or linking back from YouTube. Email: Incorporate informative videos into your email marketing plan. Remember to include the term “video” in the subject line to boost click-through rates. The genomics personalized health market has witnessed tremendous growth over the past few decades. But marketing such medicine poses a formidable challenge to date. As a marketer, you have to step up your game to promote these medical solutions custom-engineered to specific genetics. At DigiVid360, we understand the critical role that video content plays in promoting conventional and emerging healthcare solutions, including genomics medicine. You can, therefore, count on us when it comes to high-quality video production services. Get in touch with us right away for help!